Lots of activity in Copenhagen happened during the past two days. As expected, results in the form of agreements or pacts haven’t come yet – that will happen next week. So here are some more climate-related news items to digest while negotiators do their job. I’ll add them throughout the day as they come out. The 2000’s will be the hottest decade on record. Read that again: the 2000’s will be the hottest decade on record. Both the World Meteorological Organization and NOAA have come out with separate but agreeing analyses on this topic. Expect NASA to say the same thing when they release their update in the next week. We’ll have to wait until a little while into 2010 to get additional confirmation, but climate change is occurring today, period, end of story. What’s left to debate and decide? How fast and how much we act in the next 5 years. After that, it becomes how do we react, because a great deal of change will have been locked into the climate system. Categories: energy, environment, global warming, politics, science | Tags: 2009 Copenhagen climate meeting, 2009 Copenhagen Summit, climate change, climate change costs, COP15, global temperatures, hottest decade on record, lodgepole pine beetle, mountain pine beetle, NOAA, pine beetle, pine beetle epidemic, WMO | Permalink. This post will cover a lot of ground. I’m writing it having just read a PNAS paper from 2005 about a massive vegetation die-off event being tied to global climate change-type drought in the four-corner states. I have been thinking that such a study should be done as I read and learned about the various pine beetle epidemics afflicting Western North America. The paper, “Regional vegetation die-off in response to global-change-type drought” contains the kind of information that is critical in piecing a number of different threads together to weave a coherent story. The results contained within the paper, which can also be seen at this PNAS website, provide a profound message about the impacts of climate change. Such impacts have already occurred. As I’ve written recently (here and here, for example), they are growing in number and intensity. We ignore them at our (and the Earth’s) peril. A series of big messages I got from this paper can be summed up as follows. With human-forced climate change, warmer droughts are predicted to occur more often. One such drought has already occurred (and could be continuing to occur) in the southwestern U.S. That drought has had a profound impact on a large region’s worth of vegetation. That impact came in two waves: the drought weakened the vegetation which then fell to the beetle epidemic. The beetles were able to spread due to the warmth that characterized this drought. With this and other region-wide die-offs, the potential for large changes in carbon stores is real we will face with their consequences. As a result, carbon-related policies must be prepared to take such die-offs (and their after-effects) into account. The failure of region-wide ecosystems, a disaster on its own, would also present a real danger to our society. The paper identifies regional-scale mortality of overstory trees. Such events alter ecosystems and land surface properties for decades. Greenhouse forcings are expected to amplify the periodic, cooler droughts found in previous climate regimes. The drought that has occurred across the southwest since 2000 offers evidence about how those forcings manifest. [On a short tangent, the widespread, severe drought in Australia provide additional evidence.] This paper focused on a Piñon pine die-off. Additional trees act as overstory species across the four states studied. At this time, I’m not aware of similar studies detailing the greenhouse-forcing-drought-beetle-die-off relationship as it relates to those species. It is something I will look for after writing this. The reason I draw attention to the temperature rise in particular is the warning it provides about anticipated future warming across the region as the climate continues to respond to greenhouse forcing. Under scenarios now considered likely with the “warming in the pipeline”, temperatures across this region are expected to rise another 2-10C. As I wrote above, this paper demonstrates the impacts that warming has on dominant vegetation types: water stressing the plants and allowing bark beetle infestations to spread unabated. With even more warming, what effects will ecosystems in the region experience? I’ve written before about the bark beetle problem affecting the higher elevations of Colorado and other regions across the Rocky Mountains (see list below). Those trees were impacted in a similar fashion that the Piñon trees were in this study. How many additional species will be stressed to the point that they will also experience region-wide die-offs? Under those same climate change scenarios, annual precipitation is expected to continue to decrease. That decrease will be for all purposes permanent as far as humans are concerned. 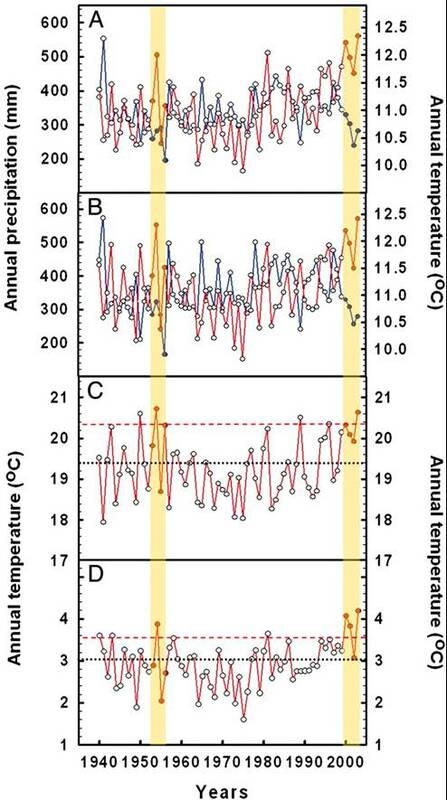 Desert-level precipiation amounts are quite possible for hundreds of years. Now look at the graph more closely. We’ve seen the devastating effects just a small quantitative amount of warming has already had. That’s one of the real dangers of climate change: ecosystems are quite used to the climate of the 20th century (in a larger sense, that of the past few thousand years). There is no way of accurately foretelling how those ecosystems will respond to a significantly different climate, which we might already have entered into. The die-offs I’ve seen and read about; the shifting climate and ecosystems zones I’ve seen evidence of tell me that the climate at the end of the 21st century could be quite different than the one of the 20th century. Expanding on this a bit: at what stage would prairie grass die-off? I can hear the denialist line about tree die-off and small animal die-off not being a big deal and not indicative of climate change. The level of tree die-off discussed in this paper was unprecedented in scope: all ages, all sizes were affected. Beyond that though, I wanted to come up with a scenario that would provide more visceral evidence of climate change impacts on human society. If grass or hay or the like experienced a regional die-off due to an expanding, long-term warm drought, what would we do? If cattle started dying by the millions due to water stress and epidemics, would more people take notice? I have to think so. I hope it doesn’t get to that level, but it might before we all aggressively look for greenhouse forcing solutions. One additional question I have is what story does the post-2004 data tell? I will look for additional, related studies to this one to fill out the scene. It was somewhat surprising that this study was published in 2005 . Nobody I’ve spoken to about the ponderosa pine die-off was aware of this paper – which is part of the reason I’m writing about it. If anyone is aware of such a study, I’m all ears. Otherwise, I’ll write something up on whatever I find. Categories: environment, global warming, science | Tags: climate change, climate change impacts, global warming, greenhouse forcing, mountain pine beetle, pine beetle epidemic, PNAS, severe drought | Permalink. Human-forced climate change has already many effects that are visible today. An article that appears in today’s Science introduces another candidate: trees in the Western U.S. are living only half as long as they did 50 years ago. In the climate most of us grew up in, western forests acted as carbon sinks. Their growth “scrubbed” carbon from the atmosphere. Climate change has introduced conditions that are drier than normal; severe drought has ensued across the region. As a result, trees are growing less and dying earlier than they used to. That could result in less carbon being removed from the atmosphere, creating yet another positive feedback loop in the climate system. Researchers focused on what’s called “background” mortality – trees dying from events that do not include infestations of insects like the mountain pine beetle currently afflicting the West, which is identified as “abrupt” mortality. They studied 76 plots where trees were at least 200 years old. They were undisturbed by logging (harder to do every year), bark beetle epidemic or wildfire. Trees being studied in Colorado were largely wiped out by the mountain pine beetle epidemic currently moving across the state’s forests, itself a trend linked to climate change. Temperature data in the research plots (across the entire West) showed an increase in every season of the year. The warming and drought conditions we’ve experienced in Colorado has also made its presence felt across a much larger region. Our forests are suffering from multiple coincident effects of a warming planet and regionalized drying. Direct human pressures such as increased population in the inter-mountain West and hundreds of years of logging aren’t helping matters. Efforts need to be made today to decrease our forcing on the climate system. Carbon emissions need to be drastically reduced so that concentrations in the atmosphere can be reduced later this century. If forests are unable to play their historic role of a carbon sink, those efforts become all the more critical. Unfortunately, it will likely increase their cost, something environmentalists cited regularly during the past eight years’ of climate inaction. The Denver Post has, surpringly to me, a pretty good article on this. Joseph Romm (Center for American Progress Senior Fellow & Climate Progress blogger) has a more scientifically-rigorous discussion of the article and its implications. I recommend reading Romm’s analysis if you don’t want to read the article itself. From the 1970s to 2006 (the period including the bulk of our data; table S1), the mean annual temperature of the western United States increased at a rate of 0.3° to 0.4°C decade -1, even approaching 0.5°C decade -1 at the higher elevations typically occupied by forests. So between 1.2°C and 2°C warming has already occurred since the 1970s. That means the forests of the future are in for bad times. If we could somehow magically stop emitting greenhouse gases today, the climate system would still get warmer for the next 100+ years due to the forcing “in the pipeline”, as climatologists refer to it. The climate system hasn’t fully responded to the gases emitted in the last 5, 10, or 50 years. Of course, no such magic is going to occur. Emissions will have to stop increasing (stabilize) then start decreasing. Which means there is plenty of additional forcing (warming) that will occur. The 2007 IPCC assessment relied on models that didn’t demonstrate the warming that has already occurred very well. Policy decisions based on that report would therefore be poorly suited for the task we face. [2nd Update]: NPR’s Science Friday discussed this paper with one of the researchers today. The segment can be found here. Categories: environment, global warming, media, science | Tags: abrupt mortality, background mortality, carbon sink, carbon source, Center for American Progress, climate change, Climate Progress, Denver Post, mountain pine beetle, Western forests | Permalink. The mountain pine beetles continued to spread through Colorado forests in 2008. The numbers are bleak: 400,000 acres succumbed to the beetles last year. That adds to the 1.5 million acres affected by the beetles in the past 10 years or so. Most of those acres were attacked by the beetles in the past few years as a medium-term drought and warmer winter nights have made their influence felt over the state and region. The area where the beetles moved through in 2008 shifted from years past to the Front Range. Their effects will be more visible to larger number of Coloradans. I’ve seen the dead trees they leave behind from roads through the Rocky Mountains and from the air, thanks to a flight set up by the Wilderness Society during the DNC in August 2008. It is widespread and it continues to grow. Colorado, after all, is only one state affected by differing species of beetles. The remainder of the Rocky Mountains also suffer from the beetle epidemic, from Mexico through Canada. The RMN article doesn’t include numbers from other states or provinces. Once I locate them, I’ll make note of them. Two pellet mills are now operating in Kremmling and Walden. They buy trees that can’t be otherwise salvaged. Lumber from dead trees is also showing up for sale in a growing number of places (thanks to efforts by people like Sen. Dan Gibbs). The Forest Service and local municipalities are trying to educate the public about the dangers of the millions of acres of dead trees. Gov. Ritter formed his Forest Health Council almost a year ago, as he works to keep up to date with the issue. His efforts led to the introduction of the Healthy Forests/Vibrant Communities Act of 2009. Colorado hasn’t seen a bad wildfire season in a number of years, which is both good and bad. It’s good because it has allowed for the removal of a large number of trees around human populated areas. It’s bad because the extent of dead trees continues to grow – setting the stage for potentially catastrophic wildfires in the future. If there is a series of dry thunderstorms one summer, a lot of acres are going to burn. $13 million in federal funds is expected to find its way to Colorado this year. That’s more than the $8 million made available last year. It’s less than the $20 million needed by agencies to help alleviate some of the threat. I will note that there were a couple of bills in the U.S Congress last year that were written to help deal with maintaining our forests’ health. Neither of them moved out of committee, despite being written by Dem. Rep. Mark Udall in a Democratic-led Congress. I realize there are plenty of things on Congress’ plate, but this is simply an issue that can’t be shuttled to the side for very long. Tomorrow’s costs due to today’s inaction grow exponentially with each passing year (wildfire and climate change both apply). Climate change is already changing the planet. The beetle epidemic is but one manifestation of it. Unfortunately, the infestation is one of the things that climatologists couldn’t predict on their own. Coordination between climatologists, biologists and many other kinds of specialists is needed to communicate the eventual effects climate change will have on the planet. As we move forward, those efforts need to be made so that their cost to our society can be appropriately tallied and dealt with. Categories: environment, global warming, science | Tags: climate change, drought, EcoFlight, global warming, Healthy Forests/Vibrant Communities Act of 2009, mountain pine beetle, pellet mills, pine beetle epidemic, Wilderness Society, wildfire | Permalink. Gov. Bill Ritter and a group of bipartisan lawmakers today announced the “Healthy Forests/Vibrant Communities Act of 2009,” a comprehensive legislative proposal that would protect Colorado’s prized forestlands, assist local communities and stimulate economic activity. “Colorado is home to nearly 23 million acres of forests – forests that are rich with diverse wildlife, clean water and unbelievable scenery,” Gov. Ritter said. “These forests also are a major part of Colorado’s economic engine. They drive our recreation and tourism industries, and can produce valuable materials for the timber, construction and renewable energy markets. The proposed Healthy Forests/Vibrant Communities Act, to be introduced for consideration in the upcoming 2009 legislative session, will help mountain and Front Range communities plan for forest health management activities, provide funds to reduce wildfire risk, protect watersheds, water and power infrastructure, and encourage business opportunities for wood-products entrepreneurs. Resources and technical support to ensure that local communities can adequately assess wildfire risks and create effective response plans. Additional support to reduce imminent threats through thinning projects focused on protecting lives, homes and community investments such as reservoirs, power lines and other infrastructure. Increased focus on long-term restoration projects in community watersheds to protect public water supplies and create high-quality wildlife habitat. A revolving loan fund to support businesses and create jobs by finding new ways to market timber and other wood products generated by community protection efforts. The Act would build on legislation that Gov. Ritter signed into law the past two years. It also would incorporate ideas from the Forest Health Advisory Council that Gov. Ritter established earlier this year and from an interim legislative committee that met this past summer and was co-chaired by state Rep. Christine Scanlan and Sen. Dan Gibbs. The Act would be funded with $5.5 million in FY09-10 with the Severance Tax Operational Account, which derives its revenues from the tax that oil and gas companies pay to “sever” or extract energy resources in Colorado. It is a relief to see responsible adults that understand and appreciate science and reality are in charge of Colorado’s government. Officials not blinded by ideology or focused on divisive social issues can and do get things done that are in the best interest of those they govern. Speaking of reality: these acts and monies are not and will not be enough to adequately deal with the threats our forests face. It’s better than nothing, but millions of acres of land are affected and this simply won’t get the entire job done. That won’t change for decades to come either. A steady, concerted effort will need to be exerted every year until the threats are reduced to more reasonable levels. That includes redutions in greenhouse gas emissions on local, state, national and global scales. Categories: global warming, science | Tags: climate change, drought, Forest Health Advisory Council, forest thinning projects, Gov. Bill Ritter, mountain pine beetle, restoration projects, wildfire risk assessment | Permalink. Climate Progress has a Core Climate Solution Primer. Recommended reading. We find that the ice sheet was losing 110 ± 70 Gt/yr in the 1960s, 30 ± 50 Gt/yr or near balance in the 1970s–1980s, and 97 ± 47 Gt/yr in 1996 increasing rapidly to 267 ± 38 Gt/yr in 2007. The 2007 number is just astounding. Quantifying it is important for other research. Regional Forester Rick Cables estimated the costs of addressing these concerns on national forests to be nearly $40 million dollars in fiscal year 2009 alone – a calculation that does not include any support to address equally critical needs on state and private lands. Categories: global warming, science | Tags: Climate Progress, Colorado drought, Community Forest Restoration Act, Core Climate Solutions, Forest Health Council, Greenland ice sheet, mountain pine beetle, pine beetle epidemic, U.S. Forest Service | Permalink. I attended “In Case You Missed It: America is in the Middle of a Drilling Boom and Energy Prices are Still High”, a talk given by a Wilderness Society economist yesterday in the Alliance Center, next to the Big Tent at the DNC in Denver, CO. I got plenty of good information from the talk, some of which I plan on blogging about in the future. I picked up a number of scientific papers issued by the Society that I will also use and distill in future posts. But this post will be about an opportunity that arose from my attendance at the talk. Last night, I was approached by Suzanne Jones, Regional Director for the Wilderness Society, about the potential for a flight today over some roadless areas as well as areas that have been affected by the mountain pine beetle. The flight was provided by EcoFlight’s Bruce Gordon. EcoFlight is a non-profit organization that takes elected officials, media and concerned citizens in the air to get a different vantage point of important environmental issues. Accompanying us were Something The Dog Said, Ian Welsh from firedoglake, and a KGNU cameraman. I’ll see if I can locate his video later. This flight, and the discussion we had before it, changed my perception of the problem slightly. I, like many in the Western states, have held the view that the extent of the problem is out of control and we must do something about at least some of the dead trees. I still view the problem as out of control. It’s likely more out of control than it probably should be, due to human’s climate forcing. However, I don’t thing we should necessarily do much in terms of dealing with the dead trees now. More on that later. I’ve covered some of the details on this problem before. I’ve covered some of the reactions that folks have proposed or have begun. A short summary: last year, over 500,000 additional acres of lodgepole pine forest fell to the beetles’ spread, bringing Colorado’s total to over 1.5 million acres of affected forest. Responses have been initiated at the local, state and federal levels. Local efforts have been the first to start, for many reasons. The federal effort is still lagging, mainly due to Republican obstructionism in the Senate as well as subpar maneuvering by Democrats in both houses. The view from the air is quite different from on the ground. That comes off as an obvious statement, and I even knew it would be so before we took off. Once over the affected regions however, the magnitude of the problem was astonishing. The CSU/Forest Service map of affected areas I’ve pointed to before succinctly presents the problem and most closely resembles what I saw from the air today. Categories: global warming, science | Tags: climate change, global warming, mountain pine beetle | Permalink.